When the sun get’s instantiated it will start moving up using Transform.Translate. When we click the sun we are calling the Super Unit called manageMoney where we input the sunValue. The sunValue is a variable set on the sun that tells us how much money we will gain when we click the sun. 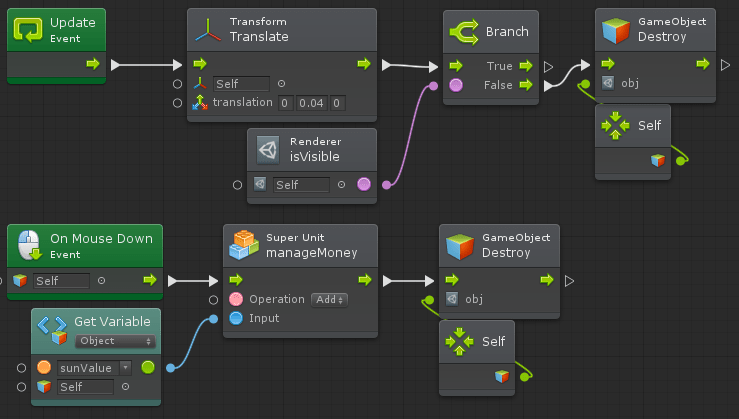 We have a Branch where we check to see if Renderer.isVisible = False. If Renderer.isVisible = False it means that our Sun is not on the screen anymore. We are going to use kind of the same thing with the Bullet. One thing I have to mention here. What we are doing here is not optimal. There will be a lot of the Suns & Bullets on our screen. A lot of them will instantiate and be destroyed and this is not optimal. We should have used an Object Pulling system. Maybe some day we will do it. This is our manageMoney Flow. We are going to use this whenever we want to Add or Substract from our money. We currently are using this only in two instances. We Gain money when we click on the sun and we lose money whenever we are building a plant. Of course if we were to have more mechanics we can use the same Super Flow so it’s kind of cool that we did it like this. The first cool thing I want to talk about here is that Switch On Enum. As you can see there it has an enumAddSub. This is a .cs script file that I created and placed into the project. When you do this make sure you go to Tools > Bolt > Update Unit Options. That will scan trough all your scripts and repopulate the options that you can chose from. It’s giving me the option to select from two options. Do I want to Add or Substract? Then the Super Flow takes care of the rest using that Switch on Enum. Awesome! 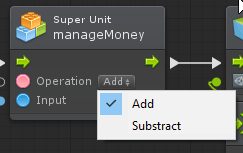 If we clicked Substract we are going to get the Input Float and subtract from our money variable. We are going to set the money variable (keep in mind that this is our main variable available on our GAME_MANAGER) to the new calculations. Then we are triggering the updateMoney event from our UI-Manager. This will update our Text Display to showcase the new value. We have our list with our plants. Those are the actual prefabs from our project. We are putting them into a List that is going to be fed into a For Each Loop. What we want to do here is Loop trough each of our plants and check the Price of that plant. We compare the Price of the plant with the current money that we have. If we don’t have money we will make the Plant Button “interactable” = False. If we have money we make the Plant Button “interactable” = True. This will take care for us of a lot of things. If you can’t click a button you don’t have money. That means that we don’t need to check to see if you have money when you are building a plant. Also the fact that we are using the “intractable” option of the button, it means that Unity also “Grays” out the button making it more transparent stating that we can’t click that button. Win Win! We renamed our plant ui buttons from “Sunflower / Firingplant” to “Sunflower-UIButton / Firingplant-UIButton”. I wanted to have more control of the name of the UI Buttons. As you can se the findUIButton is using the GameObject.Find. I wanted to be sure it will find the correct one. Since we renamed the buttons the findPlant was not working anymore. We are using a string.Split to Split the String into an Array. Then we are taking the First Item and we are inputing into the Select on String. The First Item of the Array = Sunflower because the string got split at the – (line / minus) character. The reason why we use the findUIButton is because we want a reference to the UI Buttons. Keep in mind that we have a reference to the prefabs and not the UI Buttons. Once we have a reference o the UI Buttons we know what button we can enable/disable once we know how much money you have. This is the state machine of the Firingplant. The Unplanted & Planted is similar to the Sunflower one. From the Planted state we are able to go to Firing and back. What is the most important is that Linecast. The role of the Firingplant is for it to draw a line and see when a Zombie collides with that line. When a Zombie comes into the firing range …. we are going to FIRE!! When we Enter this state we set the Animator boolean named firing to True. When we Exit this state we set the same boolean to false. This handles our animations. Then we are running two Updates. The first one is similar to our Spawn Sun from the Sunflower. We wait a Delay and we instantiate a bullet to the position you see on the right. I also updated the setParent Super Flow to accept an input for the position, so when we are setting the Bullet to be a child of the Firingplant, we are spawning it at 0,0,0. That is right in the middle of the plant! However the mouth of our Firingplant is a bit up… so that’s how we are handing the spawning of the bullet. In the 2nd Update we are doing the same thing with the Linecast only that we look at the Output (Colliding) and we see if it’s False. If it’s false we stopFiring. Yes it’s a bit long (that’s what she said). The first time I did it, it was painful. But then I learned some more and through experience I became more open to new experiences. In this case, I’m talking about the Layer Mask! The Linecast is an invisible line that starts from a Vector2 and ends in another Vector2. It accepts an input of layerMask. We use this line to see when we have a Zombie in our range. If the Zombie is in our range we will output True in our Output. The main key here is the Layer Mask. I created a new Layer called Zombie. I placed our Zombie prefab on that Layer. We tell the Linecast to only check collisions with the object that are in that Zombie layer! If we woudn’t have done that our Linecast will trigger itself the first time it hits something. Guess when! It can trigger itself right when the Linecast starts because it’s going to collide with the plant itself! It can trigger itself with the grassTile, Sunflower Plant and even the Bullet! That’s why we specify a layerMask. Since the Linecast is invisible we have to use a Debug.DrawLine so we can see the red line in our Scene view. All that’s on the left is basically us taking the position of the plant in world space (not local since that is 0,0,0 and the Linecast requires a global vector). Then we expose our Vector3 and we add to it in order to offset the start & end of the Linecast. The Vector3 is being input into the Debug.DrawLine but also in the Linecast. Then the Linecast is going to hit something the RaycastHit2D will become “Not Null”. If it’s Null we set the Colliding to “False”. If it’s NOT Null we set the Colliding to “True”. Then we output the Colliding variable to our Output that is going to be used to trigger the firing/stopFiring events. We need to make the Bullet collide with the Zombie. Since the bullet is going to collide it means we also have to implement the Health/Damage/Dying State Machine. That State Machine is going to be used both on our Plant and on our Zombie. Then, we have to implement a Zombie Spawner and implement the Zombie itself.